Benade's resonance curve for a violin suggests that the main air resonance would enhance the D string and that the main wood resonance would enhance the A string. 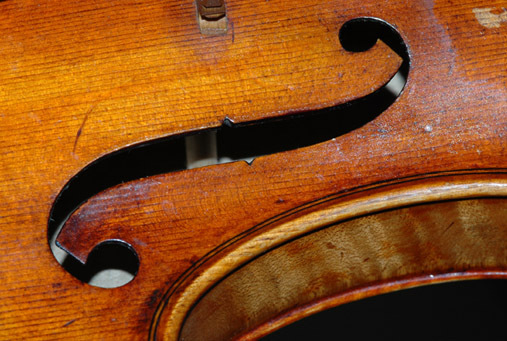 It should be compared with Hutchins' measurements for a Stradivarius. Benade's general resonance curve for a violin which is based on Schelleng's calculations, which he states have been verified by experiment. They are not meant to represent a single, specific instrument, as I understand it, but to give a typical behavior. It is interesting to note that the overall resonance curve is not a simple superposition of the air and wood resonances, which is reasonable if variations in phase caused their effects not to consistently add. The air and wood resonances shown are surprisingly sharp. air resonance and wood resonance are taken as important indicators of the quality of the instrument. The f-holes of a violin form the opening of a cavity resonator which in the resonance curve for the Stradivarius shown enhances frequencies close to the open string D4 at 294 Hz.